Right Midfield – James Benson (Australia) – Corinthian – Unlike Trapper’s departure, JB has proved harder to replace. Brilliant at bringing players into the game and impossible to take the ball off, Benson was a fantastic in the engine room during Corinthian’s best recent performances, especially in qualifying for the All-Ireland championships. Left Midfield – Michael Trounce (Australia) – Monkstown – Completing an all-Australian midfield, Trounce edges out Bray’s Phil Marshall for the left-mid berth. His hard running combined with fast stick work was perfectly matched to the side’s attacking intentions and was regularly electrifying. Whilst his impact on the side’s fortunes wasn’t massive, he had a sharp eye for goal and the ability to zip past many a flat-stick tackle. Right Wing – Nasir Munir (Pakistan) – Glenanne – Whilst his coaching and injury-proneness have got in the way of a huge amount of pitch-time for Nas, there is true magic in his hands. On his game, Nas can be unplayable, both for opponents and probably his team-mates and his typically Pakistani performance in last season’s ISC final against Annadale, coming off the bench was nothing short of inspirational, scoring without doubt the goal of the day. Oh, and he’s bagged a heap of titles as coach of Glenanne! Centre Forward – Colin Stewart (Australia) – Corinthian – In the modern era, Bacchus has probably scored more field goals than anyone. His sharpness around the circle is unequalled, with his trademark shortened grip and lightning back swing, Stewart was the aggressive end of Corinthian’s full press, sniffing for the slightest defensive lapse. 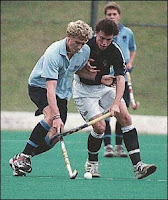 His influence on Leinster hockey is still being felt, transforming Sutton Park into one of the top three schools in Dublin. Left Wing – John McInroy (South Africa) – Pembroke Wanderers – Much like Stewart, McInroy’s opening three months with Pembroke have been characterized by his ‘shoot-from-anywhere’ attitude. Toward the back end of 2006/7, Pembroke were irresistible and scoring goals for fun – McInroy cashed in on numerous occasions. Whether he can break back into the South African squad from Ireland in Olympic year is another matter. Coach: Bert Vreeken (Holland) – Three Rock Rovers – Winning the title is some achievement; doing it with a Rovers side that were threatened with their first ever relegation the season before was nothing short of a miracle. Other foreign coaches have won titles but few have completed such a monumental turnaround. Subs: Ian Symons (South Africa) – Pembroke Wanderers – Another Olympian, Symons’ has fired in some drag-flicks but has not been the goal machine expected. Phil Marshall (Australia) – Bray – Bray’s outstanding player in 2006/7, Russell was a massive part of the club’s success. Ulli Moessel (Germany) – Three Rock Rovers – An outstanding German international who featured just a few times for Rovers. Dan Williams (Australia) – Corinthian – Williams has been a steady heartbeat for a number of years, kept out of this team by his illustrious compatriots. Graham Berry (South Africa) – Railway Union – Began with a flurry of goals before petering away, along with Railway’s good, South-African influenced early form. Dave Staniforth (South Africa) – Railway Union – Another of Railway’s South African troupe, Staniforth was a lot more than competent between the sticks.